St. Martin, you were first a soldier like your father. Converted to the Church, you became a soldier of Christ, a priest and then a Bishop of Tours. Lover of the poor, and model for pagans and Christians alike, protect our soldiers at all times. Make them strong, just, and charitable, always aiming at establishing peace on earth. Amen. 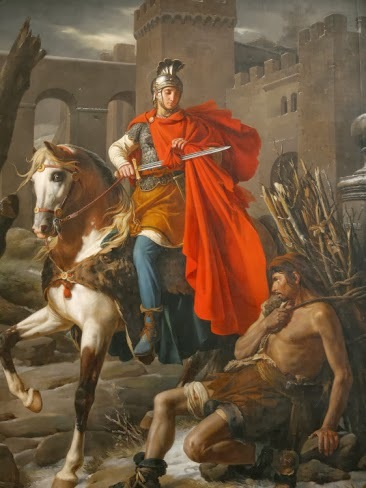 It is fitting that today we remember St. Martin on Veteran’s day since he is the patron of soldiers.He was the Roman Soldier who shared his cloak with a poor man. Take part in a Veterans Day activity.Thank our Veterans for their service.And most especially pray for Godly decisions to be made by those who serve in the military now. Martin was born at Upper Pannonia, which is called Hungary today. His father was a Roman military officer and tribune. Although his parents were pagans (did not believe in God), he began to study the Christian religion. Those who study the Christian religion are called catechumens until they are baptized. He joined the Roman imperial army in Italy when he was only fifteen in a unit that served as the emperor's bodyguard that very rarely had to fight in battle. One very cold winter day, when Martin was on horseback, he and his companions came upon a beggar at the gate of the city of Amiens. The man's only clothes were nothing but rags and he was shaking with cold. The other soldiers passed by him, but Martin felt that it was up to him to help the beggar. Having nothing with him, he drew his sword and cut his long cloak in half. Some laughed at his funny appearance as he gave one half to the beggar. Others felt ashamed of their own selfishness. That night, Jesus appeared to Martin. He was wearing the half of the cloak that Martin had given away. "Martin, still a catechumen, has covered me with this garment," Jesus said. Right after this wonderful event, St. Martin went to be baptized at the age of eighteen. Just before a battle, Martin announced that his faith did not allow him to fight. They called him a coward and put him in jail. His commander planned to put him in the front line in the battle, but when the enemy made peace the battle did not take place. A few years later, the saint left the army. He became a disciple of St. Hilary, the bishop of Poitiers, France. Because of his strong opposition to the Arian heretics (non-believers) in various cities, Martin had to go into exile. But he was happy to live in the wilderness with other monks. When the people of Tours asked for him as their bishop, he refused but they would not give up. They got him to come to the city to visit a sick person and when he got there, they took him to the church. As bishop of Tours, St. Martin did all he could to make the people of France friends of Jesus and give up their unbelief. He prayed, he worked and preached everywhere. Our Lord let Martin know when his death was near. As soon as his followers heard of it, they began to weep. They begged him not to leave them. So the saint prayed: "Lord, if your people need me yet, I will not refuse the work. Your will be done." He was still laboring for the Divine Master in a far-off part of his diocese when death finally came in 397. St. Martin's tomb became one of the most famous shrines in all of Europe.